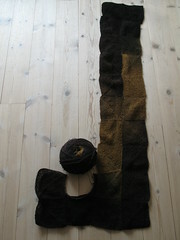 I simply had to try domino-knitting. I also had a big bundle of lovely Kauni Effekt in my stash. Each square is approx. 15 cm x 15 cm (unblocked) and I’m hoping for a blanket with 10 x 5 squares but I’ll have to knit and see how far my yarn stretches. 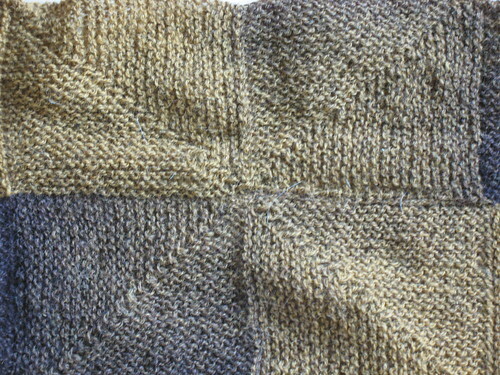 The squares are knit together as I’m not that fond of sewing nor of weaving in ends. Cast on 49 stitches, knit one row and place a marker in the middle stitch (I always use a scrap of yarn in another colour). Knit all rows while decreasing two stitches on every other row: knit until 1 stitch before marker, K3tog, knit remaining stitches on the row. 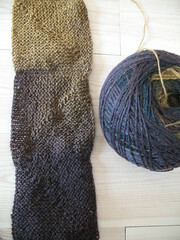 Continue knitting in garter stitch, 1 row without decreases and 1 row with decreases, until you have 1 stitch left. Cast on 24 stitches, turn and knit these 24 stitches plus the remaining stitch from the first square. Pick up 24 stitches along one side of the first square and knit these ( = 49 stitches). 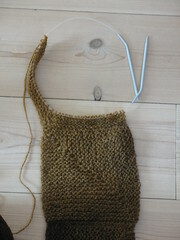 Now continue knitting the square like the first. If you want the squares to create pretty diagonal squares inside you have to fiddle a bit as you start each new square – that’s the interesting part of knitting your own Gartering Laptop! You can use any yarn you have – if you don’t mind weaving in ends you could even use a lot of scrap yarn. I recommend using a circular knitting needle. Merry knitting! This entry was posted in Inspiration and tagged blanket, Chocolate Pudding, domino, garter, laptop, squares. Bookmark the permalink. I love the idea of this throw, so I am making one out of left over sock yarns, but I am having trouble figuring out after the first row of squares is finished, how to connect the next for to two sides of the previous square. If you could help that would be great, thanks!